Is a gospel that says God deals with sinners in salvation and with Christians in daily life, purely on the basis of grace, too good to be true? Won’t it lead people to live in open sin with no regard for God’s law? We must preach the whole gospel in all its glory. If we preach the glorious good news that believers in Christ have been set free from all of our sin (past, present and future) by the once and for all sacrifice of Jesus, something we were helpless to do ourselves, it will impact the hearts of believers and unbelievers alike. We must also be careful to preach that our best most pious good works are imperfect and corrupted by pride and mixed motives, but they are acceptable to a Holy perfect God not for righteousness, but from the righteousness that has been freely given to us in Christ. Good works offered as payment to ward off punishment or to purchase blessings, are worthless. They have no value in the kingdom. But when they are offered as an act of worship – they become valuable, like wildflowers picked on the side of the road for the one we love. They have no value in themselves, but it is the motive of the heart that makes them valuable. If that good news doesn’t motivate worshipful obedience, then the hearer doesn’t understand what they have in Christ or they have yet to taste His glorious grace and are still lost in sin. Free, glorious, and amazing grace motivates Christian hearts to live for the pleasure and the glory of the One “who did not spare his own Son but gave him up for us all, …(and) graciously give(s) us all things” (Rom 8:32). Preach Jesus. Preach the gospel. Preach it all. Preach it well. It’s the only thing that will change hearts. ” Now I would remind you, brothers, of the gospel I preached to you, which you received, in which you stand,” (1Co 15:1). Good stuff. This was my favorite line – “If that good news doesn’t motivate worshipful obedience, then the hearer doesn’t understand what they have in Christ or they have yet to taste His glorious grace and are still lost in sin.” Wonderful! I’ve shared this on Twitter and Facebook. 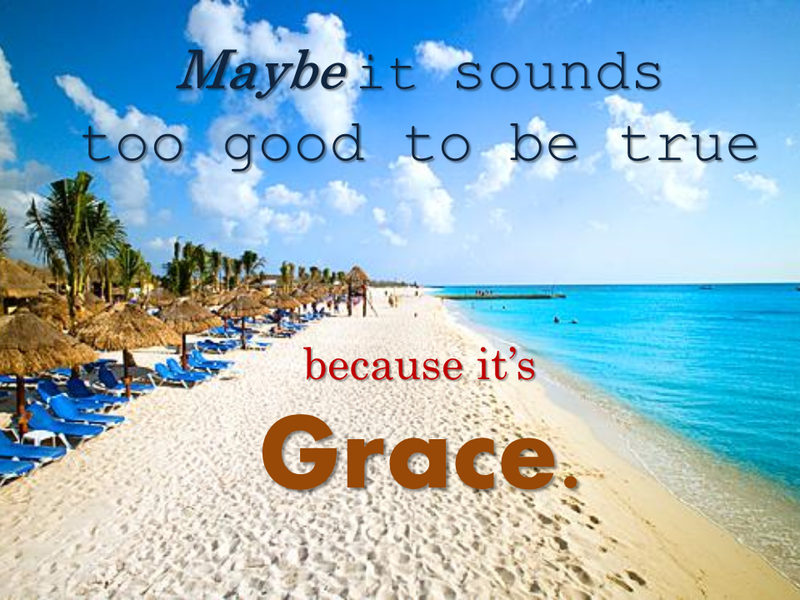 How do I understand the depths of grace that I may not sin? I need this pushed into the regions of my unbelief. It is certainly a journey. If you read a little of my testimony on the about page, I am fairly new at this too. However, I can testify that His amazing grace is transforming my life in a way that trying to perform never did. Recognizing that it is unbelief that stands in our way is half the battle. Grace and Pace. Right now I understand on an emotional, grateful level, but not near the level of Paul or even my peers. Previous Previous post: Don’t Grab the Glory.